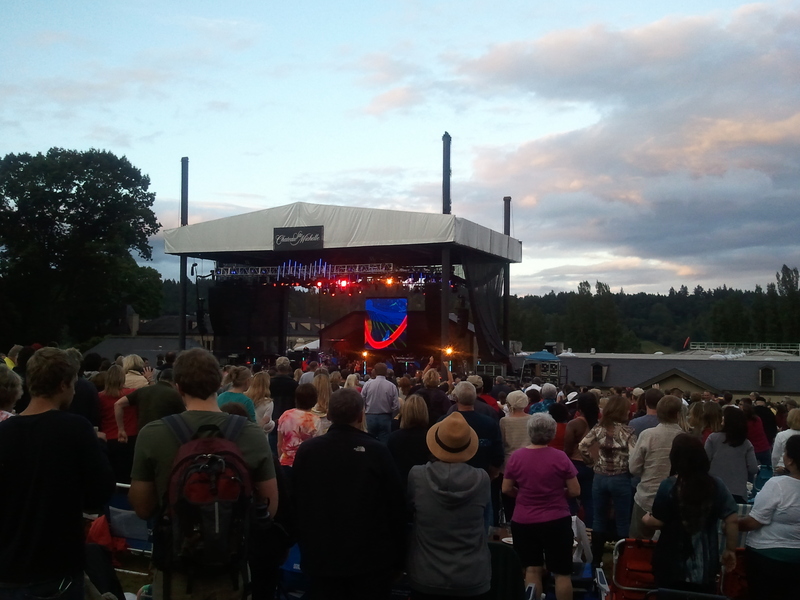 If you’re like many of us, summer isn’t complete without an outdoor concert. It might be a free concert in the park or a concert at a casino, the fair, an amphitheater, or in this case, at a winery. From June through September, Chateau Ste. Michelle has a jam-packed schedule. 2012 is bringing us a variety of acts, such as Chris Isaak, Earth Wind & Fire, Blondie and Devo, Steve Miller Band, Chicago, and more. Check out the full line-up at http://www.ste-michelle.com/ and click on Events, Summer Concert Calendar, Concert Calendar. Also, see the Concert FAQ’s. High back chairs are allowed in the high back chair area (which is open to everyone and yes, there are signs). It didn’t seem to matter too much as people are standing, dancing, or you are situated so far back that you may not see much detail of the stage anyway. Parking is available on site for $5 or there is free parking down the street (shuttles are made available). The concert will go on…rain or shine, so come prepared with the appropriate gear and clothing. Get there early to get your spot! The doors open two hours prior to the start of the show (around 5 pm for many of the shows). On this evening, we went to see Earth Wind & Fire. They had a comedian on around 7 pm and they did not come out until 8:15 or so. Even if you bring a picnic and chat with friends, I found that it was a really long wait, especially if you get there early. Speaking of food…going to Chateau Ste. Michelle for a show allows you the opportunity to go all out! Many bring a short table or blanket, picnic items, and even full-course meals! I think it adds to the experience to bring a smorgasbord of options – a sandwich, salad, cheese, crackers, bread, chocolate or whatever suits your fancy. If that doesn’t work for you, there are a number of options for purchase (fish & chips, pizza, sausages, salad, kabobs, ice cream, and more). To drink? water, juices, coffee and of course, Chateau Ste. Michelle wines. Wine can be purchased in the wine tent as well as the gift/wine shop (open prior to the concert). They will provide plastic glasses if you didn’t bring your own wine glass. Someone sitting nearby mentioned that they sell approximately one bottle per person (which means many purchase more than that), which figures out to around 4000 bottles for each concert (depending on the show). Now that is a profit! I’m not giving a thumbs up on much of their portfolio, but I can say that I have enjoyed some of their specialty and low production wines from time to time. You will also find your own entertainment by watching those around you (some after a bottle or two)… cutting a rug! If you are interested in more information about Chateau Ste. Michelle, their special events, and more… visit their website or visit Chateau St.e Michelle in Woodinville, WA. If you visit, you will find that the winery grounds are beautiful, there is a nice gift shop, take a tour for some history and wine making info…you’ll discover more about Chateau Ste. Michelle. If you have never been to a concert here, it will be hard not to enjoy it! 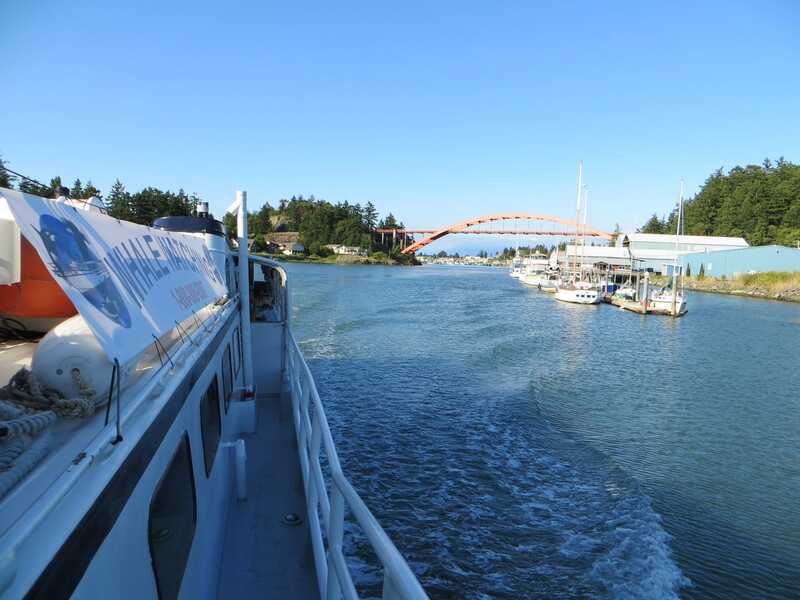 One of the best Northwest experiences… Mystic Sea Charters wine/dinner cruise via Hellams Vineyard, La Conner. Love the waterways of the north puget sound! The Seattle Great Wheel opened June 29th, 2012. It is a permanent fixture on the vibrant Seattle waterfront at Pier 57. What can be seen from the Seattle Great Wheel? Views of the Olympic Mountains, Puget Sound, ferries, container ships, Mt. Rainier, the sports stadiums and Port of Seattle, cruise ships docked, downtown Seattle, the Space Needle (celebrating its 50th anniversary this Summer! ), and more! The “Great Wheel” is close to restaurants, shopping, Pike Place Market, Seattle Aquarium, and all that encompasses downtown Seattle. 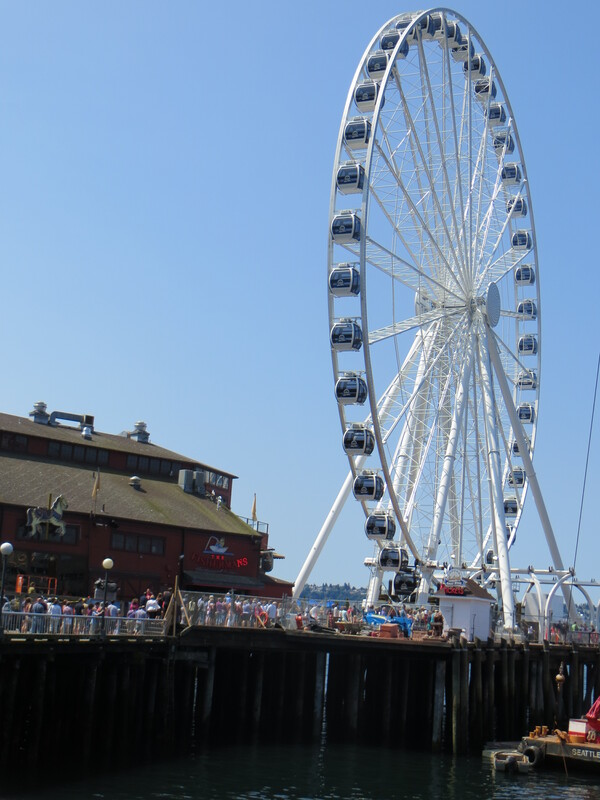 A bit of information about this new Seattle attraction… The Seattle Great Wheel is 175 feet in diameter, extends out 40 feet over Elliott Bay, stands 200 feet above the pier, and is the tallest Ferris wheel on the West Coast. It contains 42 fully enclosed, climate-controlled gondolas, which holds approximately six passengers (give or take). There is no narration. The 12-minute ride will take you through three full revolutions. Save time for loading too! Say Hi! to those waiting in line with you and have a chat with those sharing your gondola. A hint for a shorter wait in line? Buy your tickets online (and print out the ticket as you will need to provide it to the attendant). Currently the hours of operation are 12 pm – 1 am daily (check the site as hours may change/seasonal hours). I will look forward to taking the ride again…giving it a try at sunset, late at night, and during the holidays. Here’s to the Seattle Great Wheel! 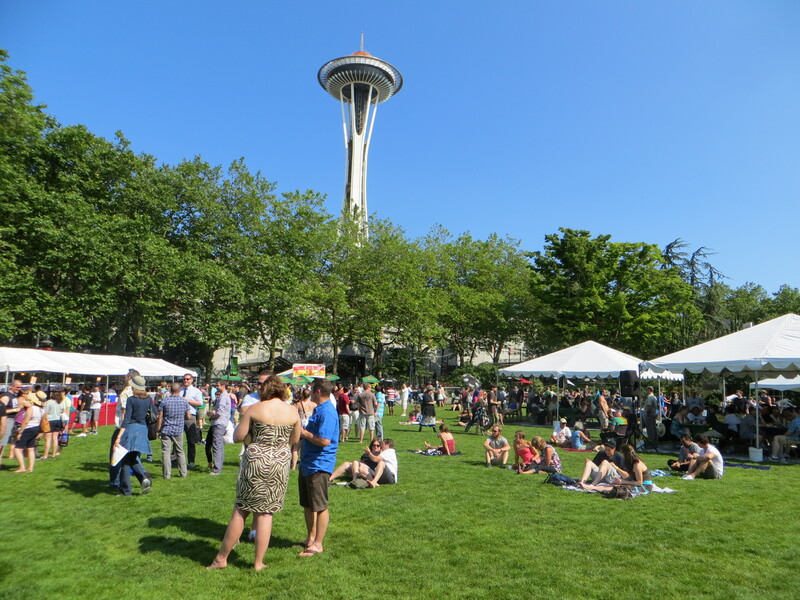 The Seattle International Beerfest was held July 6 – 8th at the Seattle Center. Over 200 beers from 16 countries were served, including some from right here in the Pacific Northwest. Do you have a favorite style of beer? I typically like an Amber, Red or ESB….which was hard to find at the SIB. I did find that I liked Hopworks DOA, Chimay Red, and a few others. If you like a Belgian style or IPA beer… then you are in luck!!! Check out the Beers list (and an interesting Glossary) at http://www.seattlebeerfest.com/ Did you miss it this year? If so, how about a road trip? 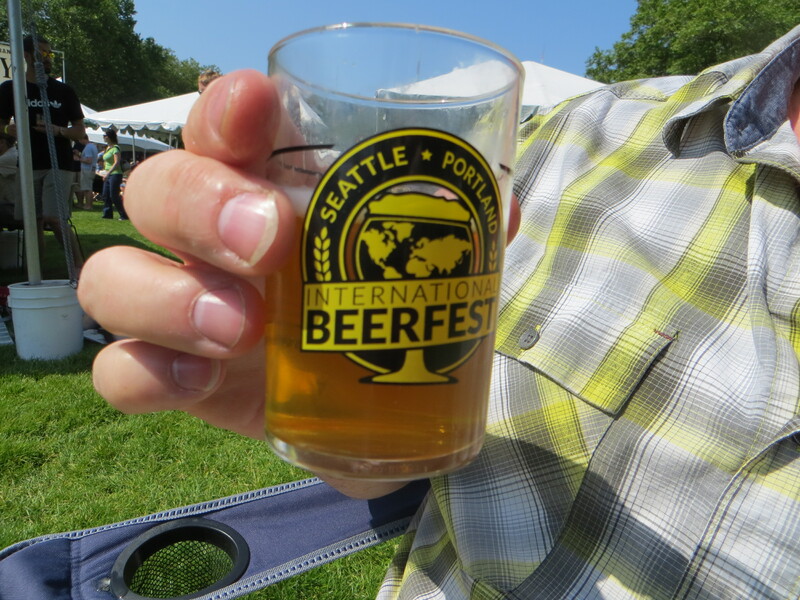 The Portland International Beerfest is July 20-22, 2012. The SIB was located at the Fisher Pavilion and lawn area (and yeh, there were indoor restrooms!). Bottles were inside and drafts were outside (in tents) on the lawn. This turned out to be a good spot for the festival. Also, there were a number of “beer gardens” that served $3 pints of Pilsner Urquell. I put quotes around the beer garden because they were open and you could take the pint anywhere within the festival. Additional tickets were $1 each. Bring your own lawn chair (or blanket) if you are interested in sitting OR get there early so that a table is found. It seemed that those that got the seating early, typically stayed there for long periods. Food/snacks were aplenty… Skillet, Pagliacci Pizza, Dante’s Inferno Dogs, Pretzelwagen, Rancho Bravo Tacos & BBQ, and more. Mt. 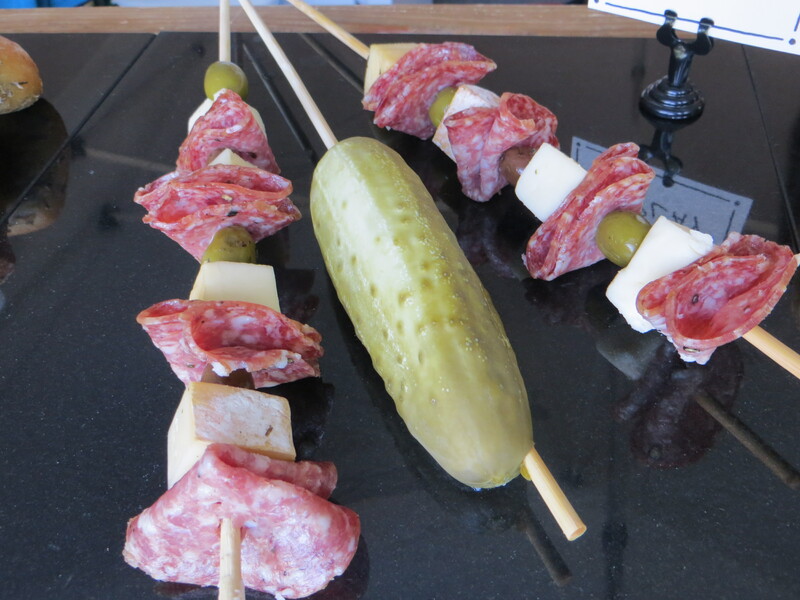 Townsend Creamery was serving a pickle on a stick and cheese on a stick (olives, salami too). Music played. There was also jerky, kettle corn, and nuts to buy. Would I go again? More than likely. Although, I must admit I am partial to the Western U.S. craft beers. La Conner – see July 2010 and 2011 postings for info! I think they are accurate and will not expand this time on the always all-around fabulous Hellams Vineyard and La Conner Channel Lodge. This visit… happy with my purchases – a necklace at Cottons http://cottonslaconner.com/ and the moose and bear ornaments at Red Door Gifts. Not so excited about the mussels from a “pub” in town. I found a few new stores, visited the tried and true, and am sorry to see that some are no longer there. Always enjoyed is a stop at Snow Goose Produce for bread, jam, and whatever else strikes my fancy. 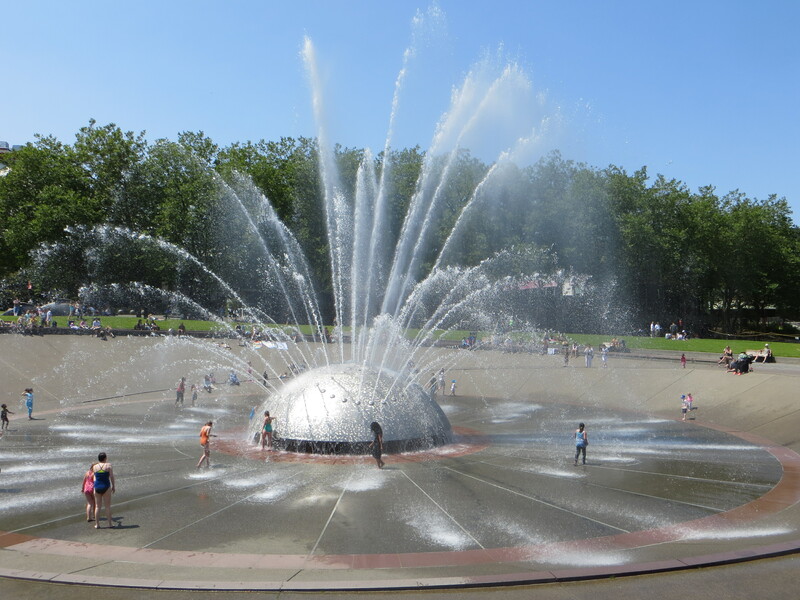 Bellevue Family Fourth, Seattle Family Fourth…and more, check your local events calendar and enjoy! Could the weekend of July 20-22 get any busier?